I’m a big fan of the Bumbo. I love squishing chunky baby thighs into those leg holes to give baby their first taste of independent sitting. When they came out with the removable play tray I thought all my Christmases had come at once, but now it is even better! Introducing the three-in-one Bumbo Multi Seat. Versatility takes pride of place in the latest Bumbo. It can be used from five months all the way up to three years old. It can safely be used on the floor or on a chair and there is new and improved wider leg room for easy accessibility. In fact, you really need to watch the video to appreciate all that the Bumbo Multi Seat can do. This awesome seating solution works for babies as soon as they begin to sit up unassisted in the same fashion as the traditional Bumbo, with its wide, stable base. Once baby start solids, you can attach the Bumbo Multi Seat safely to a chair with a three-point harness and retractable chair attachment straps that are super tidy and simple to use. 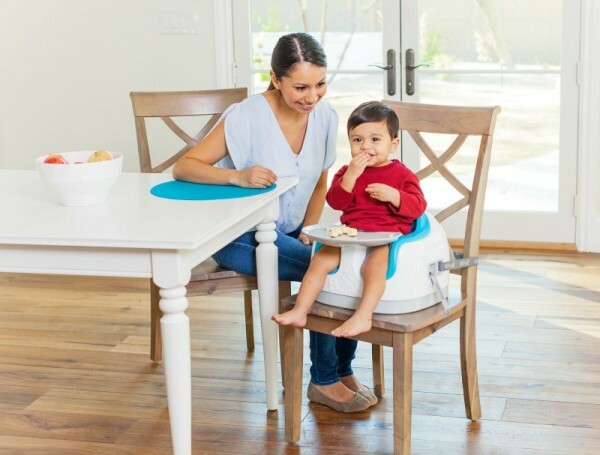 In a creative and practical move, there is a tray stored on the back of the seat that can be attached to the front for meal times and as your baby grows into a toddler and requires a bit more room, you can easily transform it into a booster seat by removing the seat’s soft foam pad cushions and storing it inside the base. The new and improved Bumbo has just been released in Australia. It retails for $120 and can be found at Baby Bunting, Bubs Baby Shops as well as online at Kids Lifestyle.